There are motorcycles and then there are the exotic kind. The latter forms the upper crest, the creme-de-la-creme. They have the all the top drawer equipment. Built using some of the finest materials, they command a hefty price for ownership. The Indian motorcycling market may be at a nascent stage, but that hasn't stopped manufacturers from selling their flagships. The numbers may not matter, but what these motorcycle do, is make a statement. They are an exhibition of the company's technological and engineering prowess. That said, and given the duty structure in our land, the money these motorcycles demand is simply eye watering. For that money, some might say, one could buy a luxury German saloon. But for those who know what a motorcycle is and does to your senses, money may not be of concern. Here's a list of the most expensive motorcycles on sale in India. Hot, Italian, exotic, pedigree. The adjectives that come to mind when describing this bike are instant. Just look at it! It's sharp and proportionate with looks that closely resemble a GP machine. It's indeed a very captivating design. The rear section with the single side swing arm offering an unhindered view of the gorgeous alloy wheel (lighter than those on the F4, courtesy of a special aluminium alloy forging technique), and the way in which the exhaust snakes up to the underside of the tail is beautiful to look at. The four tail pipes has always been a design highlight, ever since the first F4 debut. Powering the F4R is a four-cylinder, short stroke motor producing a gobsmacking 200PS. 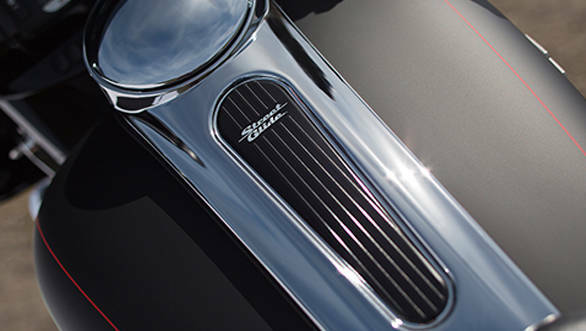 It features titanium con-rods, 50mm diameter throttle bodies and variable length intake tract (TSS). There are four engine maps three default (Normal, Sport and Rain), and one customisable by the rider. The range of customisability is quite incredible too. You can set the throttle sensitivity, torque, speed limiter, engine response and engine braking to suit your riding style. Other electronic trickery includes an Inertial Platform Lean Angle sensor, eight-level traction control system, ride-by -wire, electronic steering damper and Ohlins electronic suspension. There's an electronically assisted gearshift too that reduces shift times, helpful when you trying to set blazing laptimes. The F4 RR's frame is hand welded using TIG (Tungsten Inert Gas) technology that uses a tungsten electrode to produce the weld. The company says that optimising the frame has reduced weight without losing out on rigidity. Brakes too are top of the line Brembo Monobloc M50's. 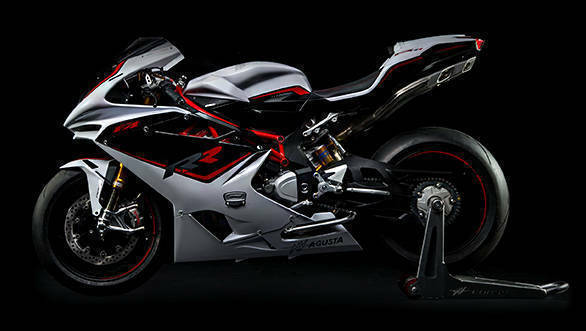 With looks to kill, a feature list that long and the best of MV Agusta's expertise gone into building it, the F4 RR is right up an avid motorcyclists wish list. 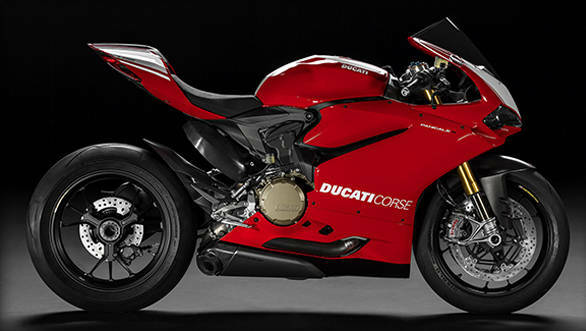 The Ducati Panigale series is easily one of the most technologically loaded motorcycles in the world. 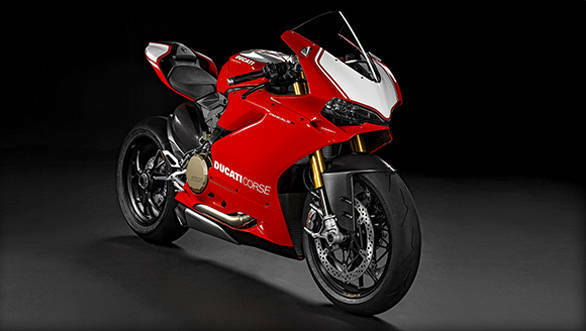 Named after the little town of Borgo Panigale in Italy, this Ducati flagship took the world by storm when it was showcased at Milan in 2014. It looks stunning, breaking away from what conventional litre class bikes look like. The full LED head and tail lights are pretty unique too. 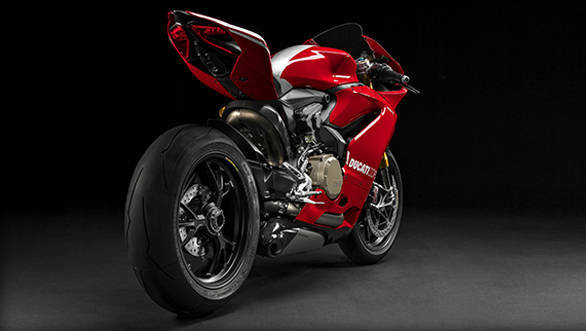 The Panigale 1299 rides on the super sticky Pirelli Supercorsa SP tyres. 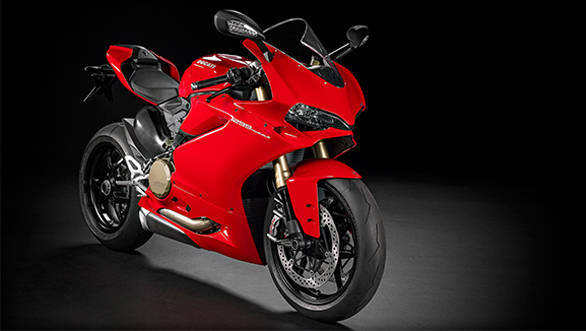 Successor to the Panigale 1199 series, the 1299 Panigale features a 1285cc, Superquadro L-Twin engine with 4 desmodromically actuated valves per cylinder. Unlike conventional four-stroke engines where valves are opened by a cam and closed by a return spring, the desmodromic system consists of two cams and two actuators, thus eliminating the need for a return spring. This system is useful in engines that rev to high rpms and stay there for longer. 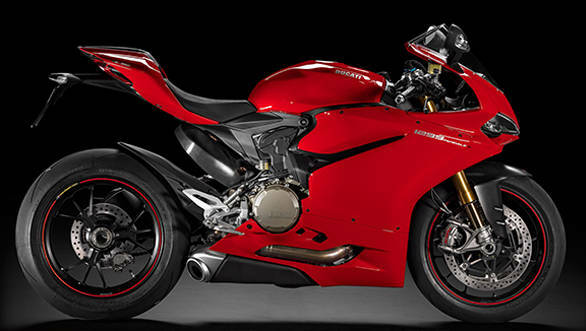 The 1299 Panigale's engine develops 205PS at 10,500rpm and 144.6Nm at 8,750rpm. Ducati has cast the the clutch cover, cylinder head covers and oil pan in magnesium alloys to reduce the weight of the engine. And the quest to keep weight low does not only end there. The Superquadro engine features a centrifugal decompressor at the end of the exhaust camshaft of each cylinder head. Upon startup, the decompressor modifies the profile of the cam opening lobe, lifting the valve slightly during the compression phase. Thus a small part of the combustion charge can escape the combustion chamber, thereby necessitating a smaller starter motor and battery, reducing overall weight. As for the decompressor, the increase in rpm and resultant centrifugal force when the bike gets up to speed, cancels the valve lift effect. One of the Panigale's design highlights is the manner in which the engine is bolted directly to the frame. 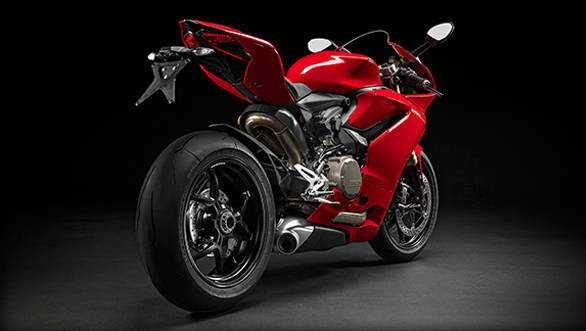 Ducati calls it the Monoscocca (Italian for monocoque) chassis, where the rear end of the chassis is attached to the head of the Superquadro engine while the front end comprises of the steering head and bearings. The chassis also serves as the air box inside which lie the air filter, throttle bodies and injectors. 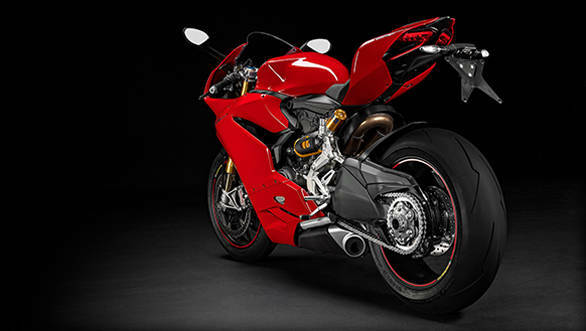 Ducati says that this design has helped reduce the overall weight of the motorcycle. That explains the kerb weight of 190kg (with all fluids). The fueling system consists of twin injectors per cylinder (first sits below the throttle body and comes on at low speeds/engine loads, while the second sits above the throttle body and is put into action when unleashing full power) and a full ride-by-wire system. The 1299 Panigale gets 50mm,pressurised and fully adjustable Marzocchi USD forks upfront and a fully adjustable Sachs unit at the rear. There are twin 330mm semi-floating discs with radially mounted Brembo Monobloc M50 calipers at the front and a 245mm disc at the rear. Cornering ABS comes as standard. There's a suite of electronics consists of a Bosch Inertial Platform IMU, Ducati Wheelie Control (DWC), Ducati Quick Shift (up/down) (DQS), Engine Braking Control (EBC) and Ducati Traction Control (DTC). 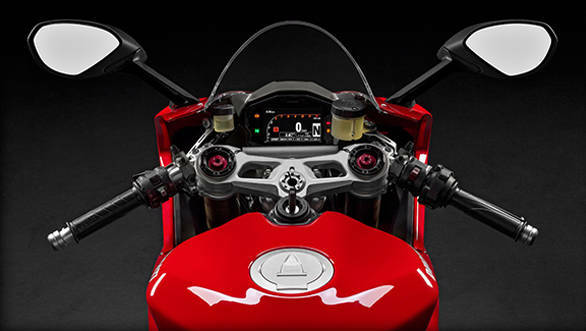 The bike is also comes pre-configured for the optional Ducati Data Analyser (DDA) with GPS. 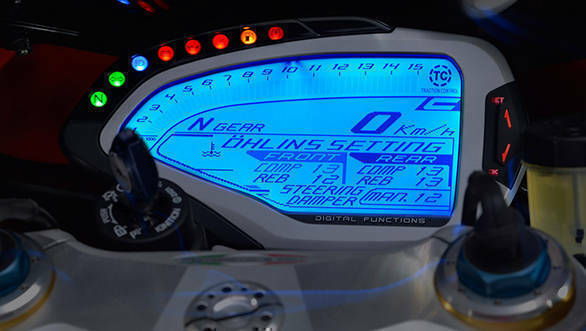 The system, with the help of the GPS pin points the rider's lines around a race track whilst recording parameters such as throttle opening, speed, rpm, gear, DTC and lean angle. In a nutshell it logs in tonnes of data, for analysis, thus enabling the rider to learn to go quicker. The TFT instrumentation changes configuration based on the mode (Road, Wet and Race) that's selected, and also has lean angle visualisation that displays the lean angle achieved in real time. 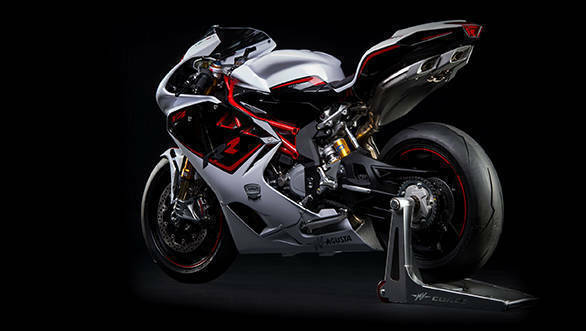 Now, if you think that the standard Panigale 1299 is way too standard for your taste, the 1299 S brings with better kit. While the engine and state of tune is the same, the Panigale 1299 S gets advanced Ohlins suspension to help lay down the power better. 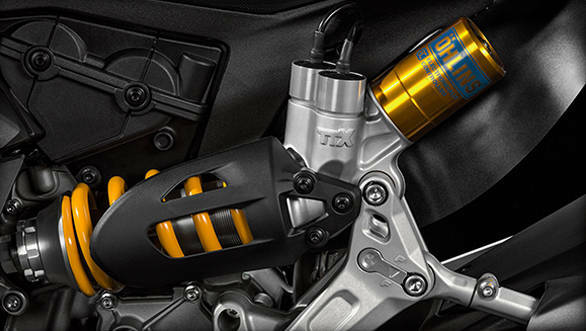 There are 43mm Ohlins NIX30 fully adjustable USD forks upfront and an Ohlins TTX36 unit at the rear. This unit features electronic compression and rebound damping adjustment with semi-active mode. What this essentially means, is that the system continuously monitors riding behavior and the selected riding mode to instantly change the setting of the shock absorber, even when on the move. Which means it remains supple when riding at street speeds or when touring and stiffens up when speeds rise, like when on a race track. 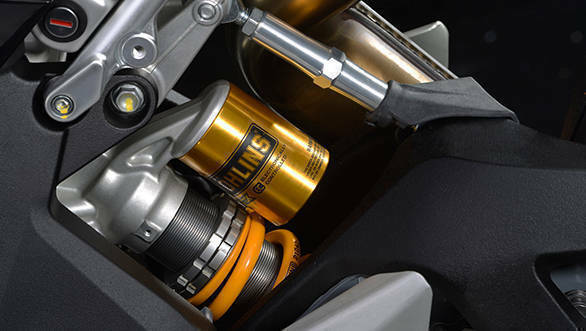 The Ohlins Suspension Control Unit constantly interacts with the ECU of the bike to react as per rider input. Visually, the changes include a carbon fibre front mudguard and W spoke alloys. The 2-1-2 exhaust system is made of titanium using stainless steel exhaust headers. 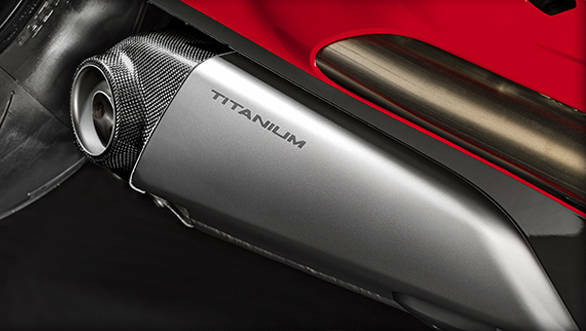 The two titanium mufflers have carbon fibre end caps. The use of this exotic material does not end there. The Panigale R gets carbon fibre mudguards, ignition and cockpit surrounds and exhaust tube heat shield. The guards for the chain, shock, and heel are also made of this material. 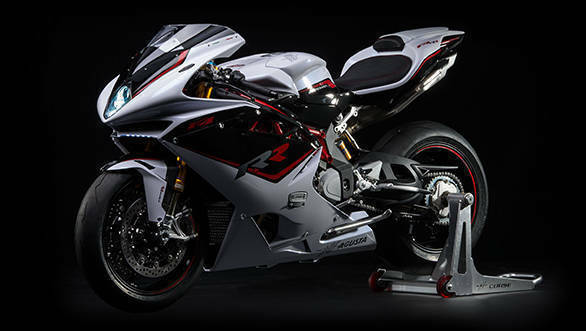 The Panigale R also gets manually adjustable Ohlins NIX30 forks and TTX36 shock, which results in a weight advantage over the electronic system. The specially designed, and homologated Akrapovic full exhaust system also help the Panigale R shed huge chunks of weight. The battery too is made of lithium-ion, which is 2 kg lighter than a conventional battery. 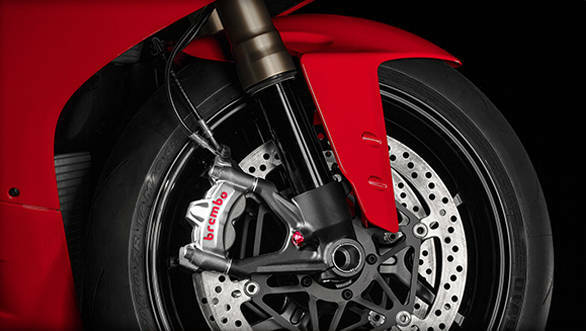 All the weight saving exercise results in a 184kg kerb weight (six kg lighter than the 1299 Panigale/ S). 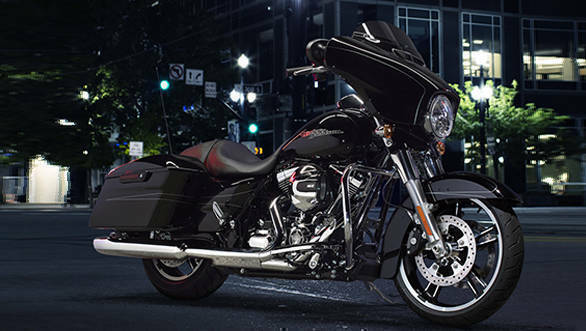 If you are the type who's not looking for out and out acceleration and top speed, and prefer long highway cruises, the Harley-Davidson Street Glide is one such cruiser with pretty much all the bells and whistles. The Street Glide is part of Harley-Davidson's Project Rushmore which aims to continuously improve the motorcycle. These include Reflex linked brakes with ABS, Daymaker LED headlamps and fog lights, brighter turn signals and brake lights and brighter luggage carrier lights and stiffer front forks. Harley-Davidson says that it has worked hard to get the ergonomics spot on, putting big test miles and working on feedback from its customers. At first the sheer size makes it look quite intimidating. The large fairing up front acts as a great wind deflector, but that's not its only purpose. Behind this lies the meters and a 6.5-inch touchscreen infotainment system with 5.25 inch speakers flanking either end of the fairing. It works like a system in a car and also has a USB port for iPod connectivity. Another development of Project Rushmore are the easy to open and larger panniers. Other touring friendly bits include a charging socket, and a battery charging harness. The Harley-Davidson Street Glide is powered by a 1690cc, air and oil cooled, fuel-injected, Twin Cam 103 engine that produces 138Nm at a lowly 3,500rpm. Indian Motorcycles may not have the fan following that Harley-Davidson enjoys in India, but these are incredibly well crafted motorcycles, with a lovely American style that's retro yet modern. 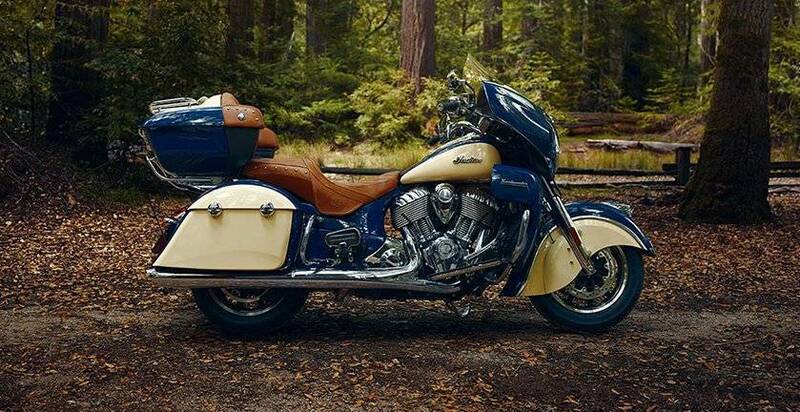 The Indian Roadmaster is the touring oriented motorcycle and boy does it look every bit the part. The humongous fairing houses Indian's Pathfinder LED headlights, complemented by two circular auxiliary lights with an LED indicator brow on each end. There's a fairing around the footpeg area too, that covers the highway bars. An interesting bit about this fairing is the vents that can be adjusted to either block or allow air to flow to the rider, depending on the weather (there are little storage pockets at the top of this fairing too). When viewed head on , and with all that chrome, the bike does look quite imposing. 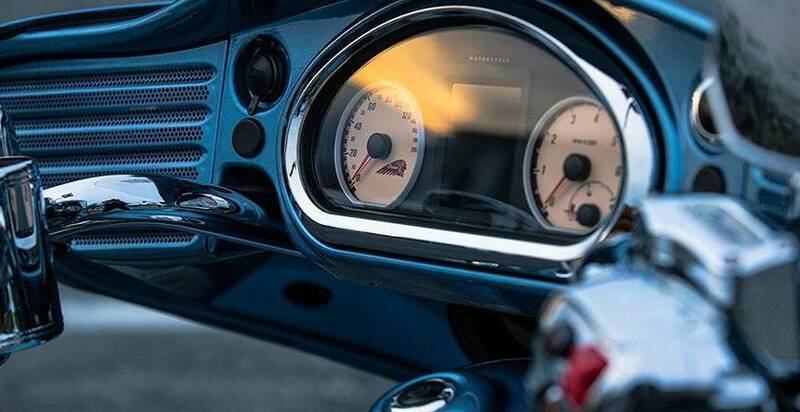 The windshield is electrically adjustable up to four inches, aiding customisability as per rider preferences. The pillion foot rest can also has a two-inch adjustment range. The instrument panel shows a plethora of information including readouts from the tyre pressure monitoring system, distance to empty, oil life, fuel economy readout, bluetooth and information from the 200W audio system. The desert tan leather seats are beautifully crafted and Indian says that its conditioned to resist fade. 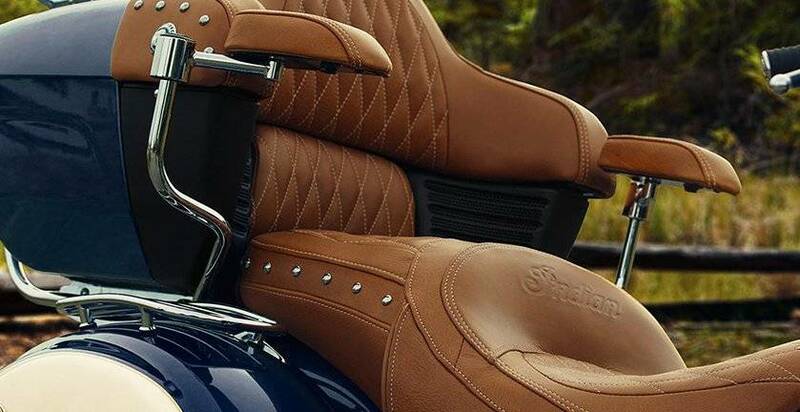 The rear trunk also acts as a backrest for the pillion, and is swathed in leather, akin to a sofa (Indian also sell armrests for the pillion as an accessory). 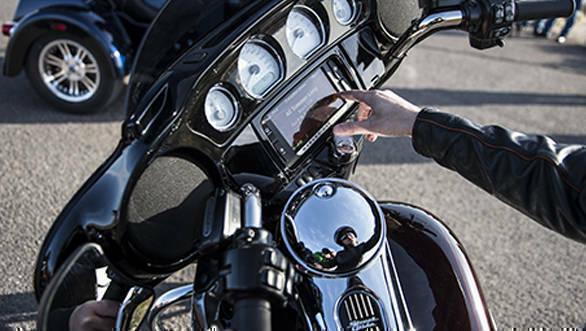 The trunk and saddlebags can be locked and unlocked remotely using the buttons on the key. 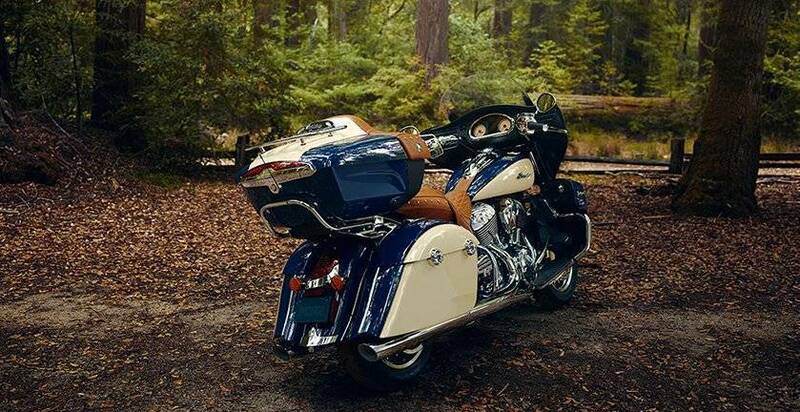 In total, there's 140 litres of storage space on board the Roadmaster. There are speakers embedded in the front fairing as well as below the pillion backrest (saddlebag lid mounted speakers can be added as an accessory). The handgrips and seats have different levels of heat settings. 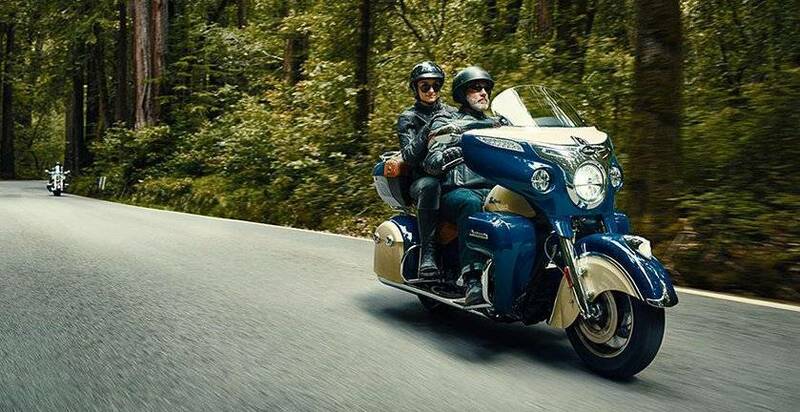 The Indian Roadmaster is powered by a fuel injected, counter balanced, air/oil-cooled Thunder Stroke 111 engine that displaces 1811cc that develops 138.9Nm at 2,600rpm. We've experienced the motor in the Chieftain and loved the smooth and calm nature of the motor. That said, the fins and cylinder head design, dripping in chrome, make it one of the best looking V-Twin motors.